As noted, the name of this blog honors the Carolina Israelite. For more on the connection, see the notes below. But the long and short of it is that Harry Golden – even as he got older – chose to focus on the good parts of his own rich tapestry of life. Which is now my goal as well. But the biggest reason – Number One in fact – is that you just like to write. In hypertext systems, such as the World Wide Web, a link is a reference to another document. Such links are sometimes called hot links because they take you to other document when you click on them. For example, note three of the links immediately above. The “words to that effect” link could take you to a reference to that phrase. 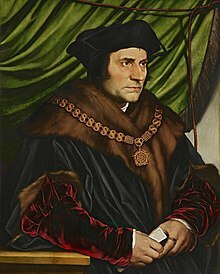 (As used by Richard Rich “in his perjurious testimony against Sir Thomas More,” shown below left.) The “Richard Rich” link could take you to the Wikipedia article, about that perjurious “Lord Chancellor during the reign of King Edward VI of England.” And finally, the “academic advisor” link could take you to the Rutgers University web page defining that term as used in the particular institution. Of course if you weren’t interested in exploring such topics in greater depth, such you could simply skip over the links. On the other hand, one result of that “linkability” is that a blogger can keep his posts short. (For example, to keep the attention of readers with the “attention span of a gerbil.”) On the “other other” hand, such links allow a blogger to bring a depth to his post-essays that was simply not possible “in the good old days.” Beyond that, such links allow a blogger to make snide sotto voce asides to his reader in a way not be otherwise possible. So, the columns in this blog will contain a point of view. As to whether they are personality-driven, I’ll leave it to the reader to determine. Unfortunately, in Harry’s delightfully retro format – an old-time newspaper or newsletter – he couldn’t use the full-color pictures, flashy graphics and built-in links that we can use in today’s blogs. So, this bit of a book review will be more than a bit of an update. The upper image is courtesy of www.colby.edu/migrations/migrations-courses-2014-2015. So anyway, a raconteur is one who “tells anecdotes in a skillful and amusing way.” Which means – again- that if Harry wrote today, “The Carolina Israelite would be done as a blog.” See About. The word “ghetto” means “foundry” in the dialect of Venice, where Jews escaping the 1492 expulsion from Spain fled in droves. They were allowed to settle there, but were forced to live in a segment of the city surrounded by both a wall and a canal that used to be the place where canons were forged. The ghetto in New York was quite a different thing. To start with, no law required the Jews to live there. They did so by economic necessity – and by choice. The Jews who settled in the Lower East Side of New York came mostly from Eastern Europe. Like most immigrant groups, they preferred to live in an area where other people spoke their language (in this case, Yiddish), and sold the goods they preferred to use. They also needed to be near sources of kosher food, synagogues, and ritual baths known as mitkva for the women. Unfortunately, in the course of updating this page, I’ve misplaced the exact source. (The “postcard” image noted in the indented quote seems to have disappeared over the course of time.) But see also Venice, Italy Jewish History Tour | Jewish Virtual Library, and Ghetto – Wikipedia. The Wikipedia caption to the George Will picture: “George Will attending a Nationals–Cardinals baseball game, Labor Day 2006.” On a related note, see also George Will’s had enough lying: His battle with Bill O’Reilly is finally an intellectual battle to reclaim the GOP from Fox News, and/or The Bill O’Reilly–George Will Feud Pulls Back the Curtain on a Civil War Raging at Fox News. The lower image is courtesy of Nell Gwyn – Wikipedia, the free encyclopedia.